Sometimes, I wish I was Cajun. They have cool accents and get to say things like “bayou” and “crayfish” without sounding weird. Their ability to make those deep, flavorful Cajun dishes comes naturally… plus they eat spicy food like it’s their business. They live in the swamp and own boats because that’s how you get around on the river. Sometimes their house IS a boat! How cool is that?! And in my own mind, they eat a lot of seafood too. And I love it even more when it’s affordable! Finding a good deal on seafood that wasn’t raised in a pond pumped with hormones and antibiotics is a big treat around here and doesn’t happen too often. Apparently, I’m not alone. From the comments you guys left when we talked about our food coming from China, it’s tough finding quality seafood just about anywhere these days. Although Mr. Crumbs isn’t a big fan of fish, he’ll devour more than his fair share of shrimp, crab and lobster. If I ever find wild shrimp for a fair price, I try to buy a pound or two and surprise him with surf and turf, or coconut fried shrimp. The only downside is that the shrimp need to be pretty big for something like that, and in most cases, the shrimp that my budget can afford are no where near big enough. Instead of never having shrimp ever again (because the big ones cost so much), we’ll use smaller shrimp in a warm, spicy dish like this creole. It’s so flavorful and delicious, and completely packed with vegetables – although you don’t have to use every single one of them listed in the recipe. You can go all out with every vegetable listed, or just go the minimum route with whatever you have in the kitchen. This dish will come out amazing in either case. Personally, I like to go all out. I’ll add as many veggies as I can so whatever meat I add goes just a bit further. Plus the kids tend to not complain about whatever-vegetable-they-hate-that-day when it’s mixed in with so many other vegetables,they hardly notice it. Zucchini? Bell peppers? Mushrooms?! Yep, they’ll eat them all. I love that their plates look like a sampling from the market! Another one of the reasons I like this recipe is because you don’t HAVE to use shrimp at all! You can use sausage and/or chicken too – whichever you happen to find hidden in the farthest remote corner of your deep freeze is fine. Or you can use a combination of any of the two, or pull out all the stops and add all three! In fact, with all the vegetables, this could easily become a vegetarian meal too. Maybe a cup of lentils instead? Whatever you decide, you can’t go wrong. Don’t let the long list of ingredients scare you. Most of them are vegetables. Another big portion are spices, which you need in order to have a good, spicy creole. Don’t skimp out on those, but do feel free to add more if you like it hotter! In my humble opinion, there are two keys to this recipe: the roux, and diced tomatoes. First, roux is a fancy term for flour cooked in fat. I used bacon grease (because bacon makes everything yummy), but you can use butter too. This is what gives the dish that depth in flavor that is so characteristic of Cajun food. It takes a few minutes to make the roux, and it almost seems silly just stirring and cooking flour in fat, but don’t skip this delicious step or you’ll taste the lack of depth later. The second key is the tomatoes. Most creole recipes call from crushed tomatoes, but I think it comes out too tomato-ey. Granted, if that’s what you have on hand and you like that thick tomato flavor, then use them! But if you’re making a shopping list or have a choice between different tomatoes in the pantry, go for the diced kind. Diced tomatoes make the dish lighter, allowing some of the other yummy flavors to come through better. Jovial’s organic Italian tomatoes are naturally sweet, thanks to their rich Italian soil and the families that care about the crop. The sweet tomato compliments this spicy dish exceptionally well! Note: As written and with all the vegetables, this recipe makes a double batch for my family. It’s an inexpensive dish to make for company, but you can also freeze half for a future meal. Or just make half the recipe now. Whatever floats your Cajun-food loving boat! Melt bacon grease or butter in a large pot over medium heat. Add flour and whisk to combine with the fat. Cook flour for 5-6 minutes, making a roux. Add onions, bell peppers, celery, carrots and garlic. Cook vegetables until they are soft and colored, stirring often, about 8-10 minutes. Add zucchini and mushrooms (if using) and bay leaves, tomatoes, white cooking wine or stock, salt, pepper, thyme and Worcestershire sauce. Simmer uncovered for 20 minutes, stirring occasionally. If using uncooked sausage and chicken, add and cook for about 5 minutes, or until three-quarters of the way cooked through. Add shrimp and cook until they turn pink and are no longer raw, about 3-5 minutes. If using cooked sausage and chicken, add with shrimp and allow to warm as shrimp cooks through. And aren’t those colors beautiful? Aim for a yellow and/or orange bell pepper to get the full spectrum of color. Red (tomato), green (zucchini) and white (mushroom) will take care of the rest. You likely have most of these ingredients already in your pantry, and since you likely don’t buy flour by the tablespoon, the true cost of this and most spices is merely pennies (literally). Here’s a cost breakdown of the ingredients, based on the prices I currently pay in my area (including some organics and buying in bulk when possible). Keep in mind that this recipe is for two meals, not just one, so we want our total to be under $10. As always, your cost will vary based on what’s available in your area. Homegrown vegetables and conventional produce will make the total less, 100% organic everything will increase it a bit. Now through May 31, 2014, Jovial Foods is offering 10% off your entire order, PLUS free shipping! Use coupon code DONTWASTECRUMBS to save on BPA-free tomatoes, true Italian olive oil, gluten-free pasta and ancient whole gain einkorn wheat. Click HERE to browse their store! What about you – Do you like spicy food? Do you ever wish you were Cajun? Okay – this looks good but I gotta ask -how on earth is it only $5. The meat alone would cost me more than that! What are you paying per pound for organic chicken, shrimp and sausage when you shop? Do you aim for around $6/lb for shrimp – split it into 8oz. portions and call it two meals? Either way, I’d love to see a greater breakdown on recipes like these. My family loves seafood ! On average, we pay $2.49/lb for organic chicken. I do aim for $6/lb for shrimp and I can get nitrate-free sausage regularly for $3 per 12oz package. If we’re hosting company, we’ll serve the whole pound of shrimp. Otherwise we split into 8oz portions and make two meals, as you wrote. I’ll update the post with a more accurate calculation of the prices, but you’re right, light on meat and heavy on veggies! Hahaha the food down here is great! 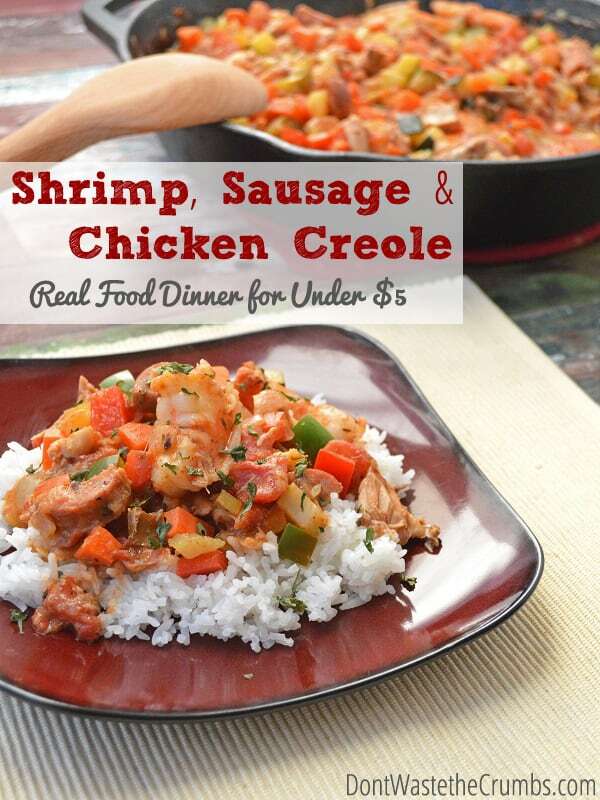 We love creole, etouffe, and gumbo though, sadly, I never make any of them myself! 🙁 I love that this is affordable and a double batch – it’s pinned for next week’s menu since I’m trying to stock my freezer for those late afternoon swim team days that are just around the corner. Thanks! Dena, you are such an encourager! What a blessing you are! Just wanted to let you know that! YUM! Going on my meal plan, friend! Love this beautiful and simple dish! Thank you for sharing with your readers!! Made this last night and it was awesome! I chopped up the veggies really small and even my picky eater ate the entire bowl! Awesome! I’m glad you guys liked it! Tiffany, I’m really excited to make this! It’s going on my menu plan for this coming week 😀 I’ll let you know how it turns out! !